Get a head start on your Christmas embroidering and save some money while you're at it! Our Christmas embroidery thread packages feature Robison-Anton Rayon and Metallic embroidery thread and come with all the colors you need to bring out the spirit of the season. Be sure to scroll down the page to view both packages! Looking for FREE Christmas embroidery designs? Check out the link at the bottom of the page! This package features 7 mini-king spools of Robison-Anton Rayon embroidery thread, including our very popular "Holiday Season" Twister Tweed which consists of both a red and green thread twisted together - the combination of colors can turn an ordinary design into something extraordinary. Each spool contains 1100 yards of 40-weight Robison-Anton rayon thread (the Twister Tweed spool contains 700 yards). (L to R): #2586 14Kt Gold; #2478 Light Cocoa; #2568 Perfect Tan; #2208 Dark Green; #2418 Red Berry; #79080 Holiday Season Twister Tweed; #2538 Stainless Steel. If you also need a spool of Black and White, may we suggest our Black & White Pack? Metallic embroidery thread from Robison-Anton is easy to work with and produces excellent results. Here's a package of classic Christmas colors featuring 4 mini-king spools of Robison-Anton "J" Metallic embroidery thread. Each spool contains 1000 yards of brilliantly colored 40-weight metallic thread. We recommend that you use a 14/90 or 12/80 needle with this thread. If you experience any thread breakage at all, slow your machine down just a little bit. #1002 Silver Metallic; #1010 Emerald Metallic; #1003 Gold Metallic and #1009 Red Metallic. 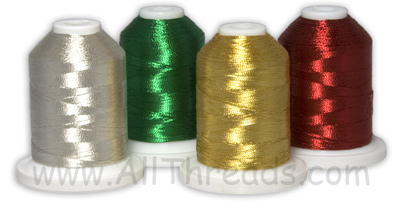 Metallic thread is regularly $11.99/spool. This package includes 6 spools of Robison-Anton 40-weight Polyester Embroidery Thread and 2 spools of Robison-Anton Metallic Embroidery Thread, color coordinated for any holiday-themed embroidery project! The Polyester spools contain 1100 yards each, and the Metallic spools contain 1000 yards each. (L to R) #1002 Silver Metallic; #5615 Evergreen; #1003 Gold Metallic; #5676 Maroon; #5540 Kelly; #5597 White; #5596 Black; $5678 Red. Dozens of FREE designs to download!